Alex Turner uses a powerful Selmer Zodiac Twin 30 Amplifier in his music equipment setup for the Arctic Monkeys. There's a Shure sm57 microphone connected to this Selmer amp. In [this interview](http://www.musicradar.com/news/guitars/interview-wes-borland-on-rejoining-limp-bizkit-and-new-album-gold-cobra-484071/), Wes Borland talks about the Limp Bizkit album Gold Cobra. 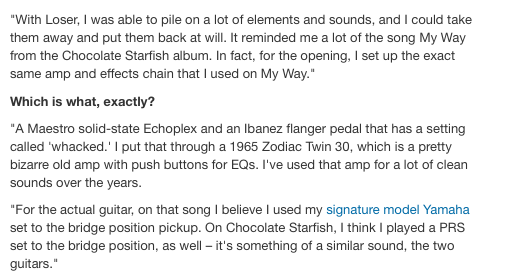 He describes the "amp and effects chain that [he] used on My Way," saying, "A Maestro solid-state Echoplex and an Ibanez flanger pedal that has a setting called 'whacked.' I put that through a 1965 Zodiac Twin 30…"
At 12:30min Hince is showing his Zodiac amp. In this scan of a Guitar World article it reads, "Smith's main amps were Vintage Vox AC30s, and old Orange and a Selmer Zodiac Twin 30." Bought this in the 60's - never let me down! Good old fashioned valve amp - loud for 30 watts. Celestion speakers, very heavy amp. as a brit amp fanatic I gotta know, man! GZ34 Rectifier, 2 X EF86 and 3 X ECC83 (Pre amp Stage) and 2 EL34 in the power amp.